It began as a set of hints and tips for using Vader. Several users then built those into a simple trading strategy. Over the last six months it has become one of the top forex strategies out there. Forex trading boils down to one basic question: Will the price go up or down? Vader’s answer to that question is “Let’s wait and see”. And it’s the core of this easy forex strategy. Vader waits for the price to come to it. That makes this easy forex strategy different from the rest. No need to get lost in forex mumbo jumbo. Vader simply waits for the price to make a clear choice using its Fibonacci levels. 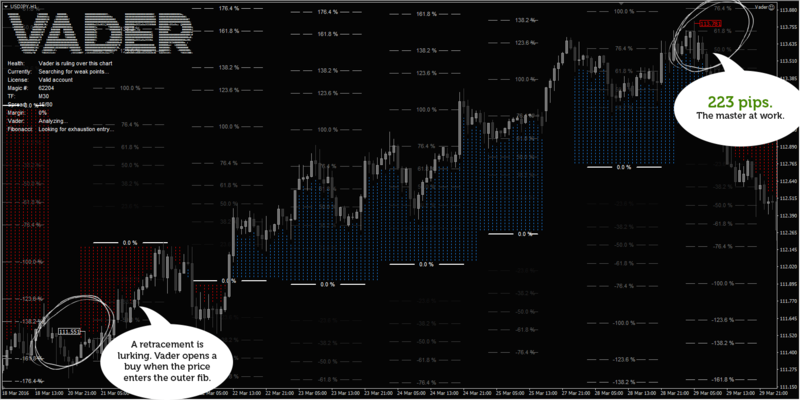 When the price breaks above or below the daily fib levels a trade is opened. It sounds simple but it works very well. If you don’t have Vader you’re in luck. We’re giving away an extra robot this week with every download. Let’s get started by opening MetaTrader 4. Open charts for EURUSD, AUDUSD and USDJPY. If you can’t trade these pairs use other low spread pairs instead. Attach Vader to all three charts using its default settings. Fibonacci levels help Vader catch big price movements like this one. You should now have three charts open with Vader loaded on them. Let the fun begin! Vader is a fully automated forex robot that doesn’t need anything else to work. Sit back and let Vader do its job. You’ll want to leave MT4 running 24 hours a day while the market is open. Vader will find and manage forex trades for you. You can still trade alongside it if you wish. Or even run other robots. Just keep an eye on those account margins if you do. P.S. Ready For More Pips This Year? The truth is most forex traders won’t make it on their own. Using a forex robot can help you beat those odds. This easy strategy is a great step towards more pips and less frustration. And that’s a winning combo.